Acupuncture adjusts the flow of vital energy in the body, a highly effective modality in conjunction with other medical procedures. Acupuncture is offered by Dr. Thomas Timmons for a wide variety of equine health issues (see list below), restoring balance and well-being. Acupuncture is a method of health care with roots in ancient China. Its techniques have been developed and refined through at least 3000 years of continuous use. Acupuncture today is recognized throughout the world as a safe and effective form of medicine which requires extensive training for its proper practice. Acupuncture works by adjusting the flow of vital energy in the body. The energy called “QI” (“chee”) flows through channels called meridians, and it is on these 14 meridians that the 365+ acupuncture points are located. The meridians and their branches form a network which unites and relates all of the body’s organs and functions. Disease is seen as a disruption in the movement of QI. By stimulating the acupuncture points that are in or associated with the affected areas or functions, we can restore balance and resolve the disease. Before therapy can begin, a Chinese diagnosis is made. This is accomplished through a systematic process of evaluating a patient by observing, touching, listening and inquiring. The acupuncture needle acts in effect like an opener and closer of doors or gates—somewhat like locks on a water way. The needle summons or permits (pushes and pulls) energy from one pathway to another. The intention of this process is to correct energetic disturbances and allow the body to govern and regulate itself in a normal manner. The patient, in effect, heals itself, not through palliation or suppression, but by correcting what is fundamentally wrong. Most horses tolerate the acupuncture well and even enjoy it. The treatment session may last from 10 to 30 minutes. Depending on the treatment intensity, the patient may be fatigued for a day or two. Riding following a treatment is not recommended. Whenever acupuncture is implemented, it is important to combine traditional veterinary medicine with the beneficial effect of this ancient Chinese art. 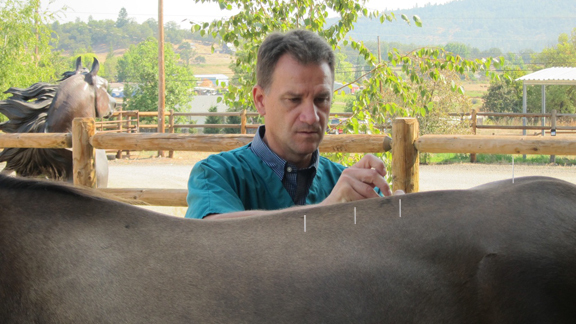 Acupuncture can relieve the symptoms and lessen the discomfort of many equine health problems. The following is a partial list of equine problems which long clinical experience and modern research tell us can be treated with acupuncture.